Director/Producer – George Waggner, Screenplay – Curt Siodmak, Photography (b&w) – Joe Valentine, Music – Hans J. Salter, Special Effects – John P. Fulton, Makeup – Jack Pierce, Art Direction – Jack Otterson. Production Company – Universal. Larry Talbot returns from America to the Talbot family estate in Wales. While Larry is out walking with Gwen Conliffe, a local girl he is interested in, and her friend Jenny, they visit a Gypsy circus. Jenny goes to get her fortune told but the fortune-teller recoils in fear at what he sees. Immediately after, Jenny is attacked by a wolf while walking through the woods. Larry rushes to her aid and kills the wolf with his silver-headed cane, not before it bites him. The Gypsies tell Larry that what he killed was a werewolf and try to warn him that because he has been bitten he will now become one too. Larry is disbelieving but as the moon comes out, he turns into a wolf. In wolf form, he is driven to attack the villagers. The so-called vampire lore we know today is only an iceberg-tip of various Central European legends that were distilled by Bram Stoker in Dracula (1897). Stoker left out much that did not suit his story and what he did take went on to become the ‘official’ vampire lore that we know today. Things become even more fascinating when it comes to werewolf lore. The legend of the werewolf can be traced all the way back to the Ancient Greeks but it is interesting to note that what we recognise as werewolf lore is something that has been synthesized wholly by the movies and in particular by The Wolf Man here. (There is at least one respectable volume of mythology that cites scriptwriter Curt Siodmak’s fictional ditty “Even a man who is pure in heart/And says his prayers by night/May become a wolf when the wolfbane blooms/And the autumn moon is bright” as a genuine piece of folklore). The Wolf Man was also the first work to lay down the werewolf’s aversion to silver. Universal Studios had had great success in the early 1930s with films like Dracula (1931), Frankenstein (1931), The Mummy (1932) and The Invisible Man (1933). The title creatures in each of these went on to become what have become informally known as the Famous Monsters. Universal had made several tentative attempts to create a werewolf film during this period, most notably with WereWolf of London (1935), although that had not been a huge success. (In fact, the script for The Wolf Man had started out as a project for Boris Karloff in the early 1930s but was never made because the themes were considered too radical. The finished version here was eventually rewritten from scratch by Curt Siodmak). The Wolf Man was the last of Universal’s Famous Monsters. During the 1940s, the Famous Monsters were multiply sequelized and then paired up against one another in various monsters bashes – see below for the Wolf Man’s further appearances in these. Despite its stature as a classic, The Wolf Man is dated when seen today. Even considering it was brand new back then, much of the film is hammered home without an ounce of subtlety – wolf targets pop up when Lon Chaney Jr takes part in a fairground shooting contest, dogs bark at him, people mutter “Even a man who is pure in heart …” portentously every five minutes. When The Howling (1980) had dog food commercials and cards spelling ‘Wolf’ dotted in its background, you realize that it was doing more than making wolf jokes but parodying The Wolf Man. Furthermore, The Wolf Man is never what one might call a convincing film – there is not even a vague attempt made at creating a convincing evocation of Wales/England – the countryside is pure studio backlot and the supposedly Welsh cast are American to a person – indeed, the only person throughout with an English accent would seem to be Claude Rains who at least was the genuine article in real life. George Waggner’s direction can be considered prosaic at best. The film gets a certain rudimentary atmosphere out of having all the lycanthropic action take place on what looks like a single stage set of perpetually mist-covered woods. (Oddly, for a werewolf film – and one that is so crucial to what we regard as werewolf mythology today – there are no full moons seen throughout). George Waggner is certainly no James Whale, nor even in the league of the other occasionally more stylish directors of the era like Robert Florey, Karl Freund and Rowland V. Lee – his set-ups are the same pedestrian medium angles and closeups used by just about every director churning out B movies through the 1940s and 50s. In the extras of the modern dvd release of The Wolf Man, there is an interview with Curt Siodmak who claims that his original idea was that we never saw any transformed wolf man, that he wanted the audience to be left unsure throughout whether or not it was all in Lon Chaney Jr’s head. This idea of the ambiguous creature transformation was taken up the following year by RKO’s Cat People (1942), which was undeniably influenced by The Wolf Man, and became a classic because of the way it hovered in an uncertain territory, leaving it up to the audience to decide whether the transformation was real or psychological. However, Universal chose to go the route of having the wolf man and his transformation visible on screen. The Wolf Man was the film that began the special effect of the wolf man transforming via a series of lap dissolves. 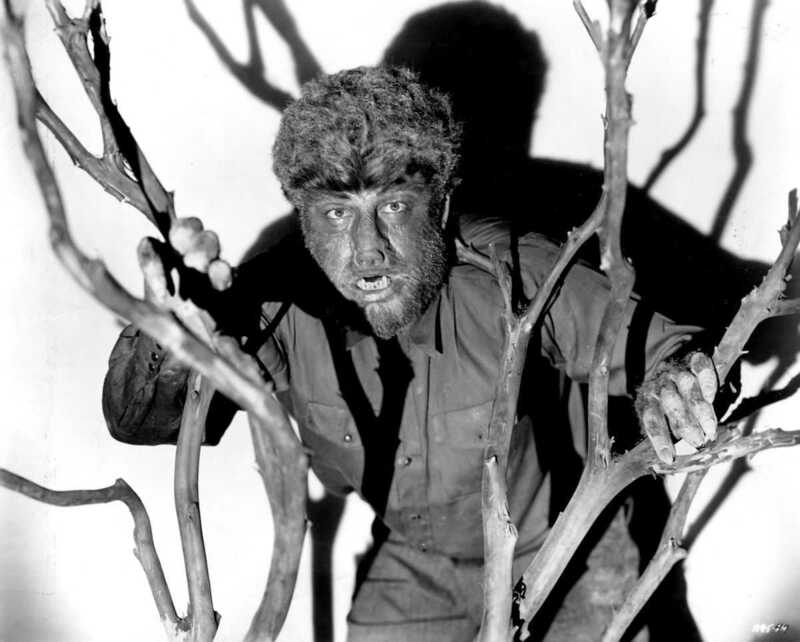 Lon Chaney Jr was held in place and the scene shot one frame at a time as pieces of fur were gradually glued all over his body, giving the effect of the fur sprouting and growing when the section of film was seen in real time. The effect is crude today but held an undeniable frisson in the day. Surprisingly, for such a famous effect, the actual facial transformation does not take place until Lon Chaney’s death scene at the end. The initial transformation is oddly focused around Chaney’s feet!!! It is also amusing during Chaney’s first transformation to note that beforehand he is outfitted in vest and pants but by the time he has transformed he has apparently retained enough state of mind in his emerging lycanthropic state to change into a boiler suit. The full makeup looks for all the world like Chaney cavorting about in a Russian ushanka hat. The Wolf Man was the most famous film to star Lon Chaney Jr. Chaney was the son of the more famous Lon Chaney [Sr], an actor who gained great fame during the silent era with roles in films like The Hunchback of Notre Dame (1923), The Phantom of the Opera (1925), London After Midnight (1927) and The Unknown (1927) wherein he underwent amazing feats of physical discomfort and makeup transformation for the part. Lon Chaney Jr was born Creighton Chaney and even appeared under that name playing bit parts in several films during the 1930s. From around 1935, under pressure from the studio, he began to bill himself as Lon Chaney Jr, before attaining fame in Of Mice and Men (1939). With The Wolf Man, Lon Chaney Jr was thereafter defined as a horror actor. He enjoyed considerable employment in the horror films of the 1940s but his career beyond that began to wane. Through the 1950s and 1960s and up until his death in 1973, Chaney was well and truly in the same territory that Bela Lugosi ended up in the last decade of his career. 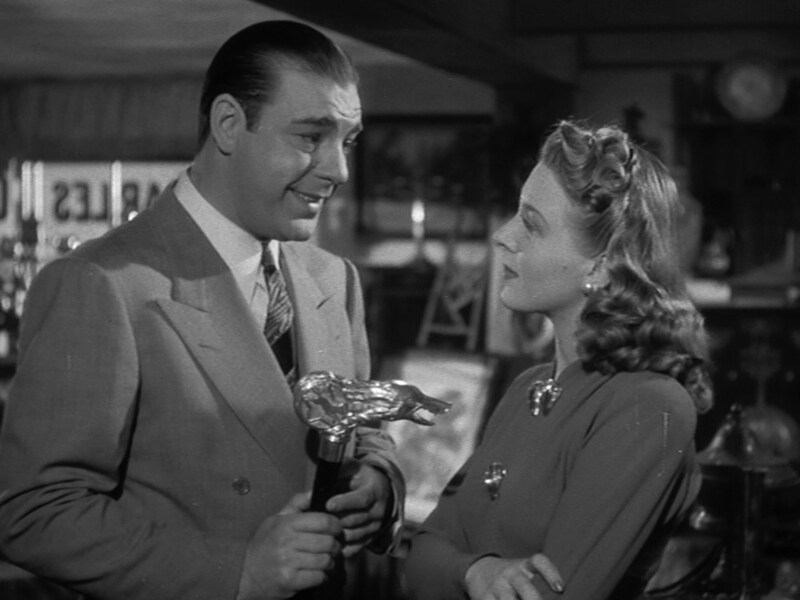 Certainly, with his rubbery lips and sallow, flabby bulk, Lon Chaney Jr is the least convincing romantic lead possible. He seems like a big lugubrious softie who approaches everything with a childlike simplicity – the sight of him trying to cry is not a pretty one. Indeed, Chaney’s attempts to woo Evelyn Ankers come out as decidedly creepy, something that today we would regard as stalkerish – he uses a telescope to remotely peep on her dressing then goes down to the store and pretends to be a customer, before asking about the earrings he saw her putting on in the bedroom and demanding that she brings them down – and then tells her he will be there at 8pm to take her out that night. Somewhat surprisingly, she consents to this (despite having a fiance). There was no direct sequel made to The Wolf Man as such. 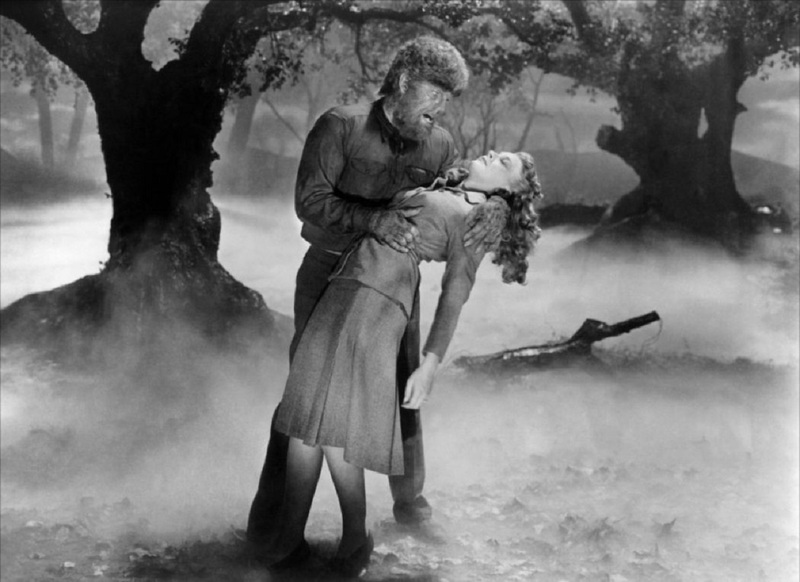 However, the wolf man appeared in all of Universal’s monster bashes beginning with Frankenstein Meets the Wolf Man (1943) and continuing through House of Frankenstein (1944), House of Dracula (1945) and Abbott and Costello Meet Frankenstein (1948). Lon Chaney Jr played the role of Larry Talbot in all of these. There has been no actual remake up until The Wolfman (2010) starring Benicio Del Toro. The Wolfman (1979) starring Earl Owensby is a werewolf film but is unrelated. The plot of The Wolf Man was uncreditedly uplifted and transplanted into a satiric attack on the Nixon White House in the amusing parody The Werewolf of Washington (1973), while the “even a man who is pure in heart …” speech is parodied in Pandemonium/Thursday the 12th (1982) and the I Was a Teenage Werebear segment of Chillerama (2011). There have been various other appearances of the Wolf Man in monster bashes such as Mad Monster Party? (1967), Transylvania 6-5000 (1985), The Monster Squad (1987) and, in particular, Van Helsing (2004), which quotes “even a man who is pure in heart …”, although the only one of these that identifies the wolf man in question as Larry Talbot was the tv series Penny Dreadful (2014) where he was rewritten as a gunslinger (Josh Hartnett) hiding on the run in Victorian England. Lon Chaney Jr later played an unnamed wolfman in the Mexican comedy The House of Terror (1960) that was later issued in re-edited form as Face of the Screaming Werewolf (1964). Screenwriter Curt Siodmak was a German native who had worked as a novelist and began writing scripts in Germany with the science-fiction film F.P.1 Does Not Answer (1932). Siodmak and his brother Robert fled to the US with the rise of the Nazis. Robert Siodmak later became a director known for film noir thrillers such as Phantom Lady (1944) and The Spiral Staircase (1946), as well as the Lon Chaney Jr starring Son of Dracula (1943), the camp classic Cobra Woman (1944) and the gonzo swashbuckler The Crimson Pirate (1952). After the success of The Wolf Man, Curt Siodmak made a career writing B movies. Curt Siodmak’s genre scripts include Trans-Atlantic Tunnel (1935), The Ape (1940), Black Friday (1940), The Invisible Man Returns (1940), The Invisible Woman (1940), Invisible Agent (1942), Frankenstein Meets the Wolf Man (1943), I Walked with a Zombie (1943), Son of Dracula (1943), The Climax (1944), House of Frankenstein (1944), The Beast with Five Fingers (1946), Tarzan’s Magic Fountain (1949), Riders to the Stars (1954), Creature with the Atom Brain (1955) and Earth Vs the Flying Saucers (1956). He also directed/wrote several films with Bride of the Gorilla (1951), The Magnetic Monster (1953), Curucu, Beast of the Amazon (1956) and Love Slaves of the Amazon (1957). Siodmak also wrote the classic novel Donovan’s Brain (1942) about a millionaire’s disembodied brain that ends up mentally controlling the scientist that removed it, which has been thrice filmed as The Lady and the Monster (1944), Donovan’s Brain (1953) and Vengeance/The Brain (1962). Siodmak’s lesser known follow-up Hauser’s Memory (1968) about transplanted memories was also filmed as the tv movie Hauser’s Memory (1970). George Waggner is mostly known for directing various B-budget Westerns. Just prior to The Wolf Man, he had worked with Lon Chaney Jr on Man Made Monster (1941) where Chaney plays a man who is turned into electrified monster by a mad scientist. Within the genre, Waggner also made Mystery Plane (1939), Horror Island (1941) and The Climax (1944), as well as produced the Claude Rains version of Phantom of the Opera (1943). In the latter two decades of his career, Waggner abandoned film work and moved into television.